For a small country, Portugal’s weather can vary dramatically. Although one of the southernmost countries in Europe, its climate – particularly in the north – is heavily influenced by the Atlantic Ocean. For cyclists, the main thing to take into consideration is the temperature – it can get extremely hot in the summer (and quite cold up north in the winter). 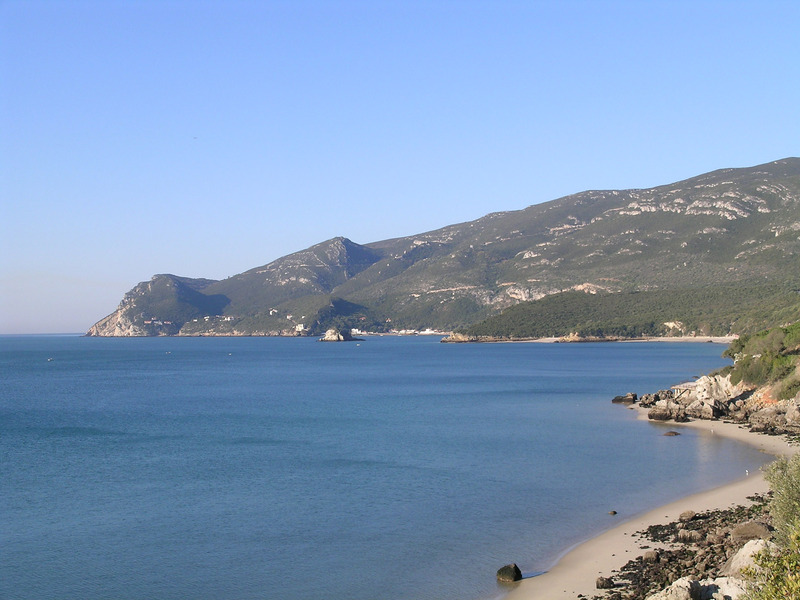 The Arrabida coast just south of Lisbon in February. Generally – unless you’re happy cycling in temperatures of 40ºC and above (that’s 104ºF) – you do NOT want to ride anywhere south of the Tejo in July and August. June and September can also be uncomfortably hot in the afternoons. For the rest of the country – particularly away from the coast – temperatures will also be in at least the high 30s for much of the summer. In winter, the mountainous northern provinces – around Braganca, Guarda, Viseu etc – can be snowy and bitterly cold. However, this can be a good time to visit the Algarve and – sometimes – the Alentejo, when the skies are often blue for days on end and – although the nights can be cool – the days a lovely temperature for cycling. Obviously, the weather isn’t fixed and there will be years when this advice doesn’t work. I cycled the length of the country in January and February and only had rain twice. I also spent time living in the north and have enjoyed some beautiful winter rides with clear blue skies and pleasant daytime temperatures. Two other factors to take into account when planning a ride are the prevailing winds and light intensity. The winds in Portugal are generally either from the Atlantic or from the north.This far south, the sunshine can also be extremely bright. If you’re at all sensitive to the light, you’d be well advised to make sure you’ve got good wraparound sunglasses and, preferably, a visor on your helmet. Institute of Meteorology, Portugal – English language version giving three, five and 10-day forecasts, searchable by region and city. BBC Weather – link to the five-day forecast for Lisbon (go to Find A Forecast for other Portuguese towns). Note: Recommendations for any other reliable forecasters welcome! Climate Charts.com has weather statistics for a number of key locations around Portugal, as does World Climate.com – just put town names into the search box.